My painting series, "Masks of God ..." explore the human spiritual quest. 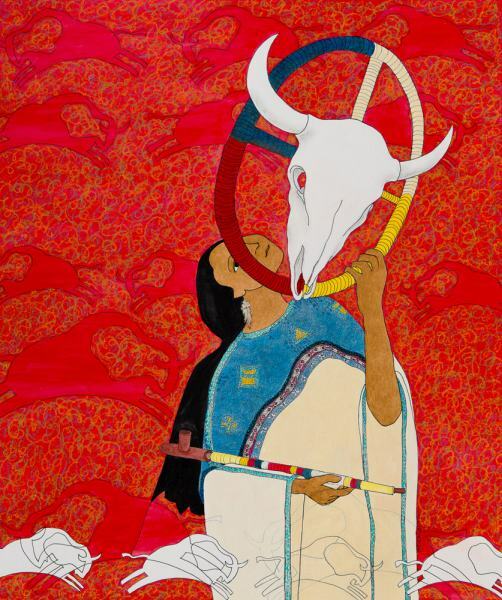 This painting tells of the Lakota Sioux belief that the White Buffalo Woman gave their world the Peace Pipe. When there are 4 white buffalo alive at the same time, Peace will return for all. The White Buffalo Woman is the fourth. Masks of God ... The White Buffalo Woman, 2014, acrylic paints, inks, oil pastels on bristol board, 24 x 20 in.